NASCAR has announced it will restructure its regional touring series divisions beginning in 2007. Citing declining support for the Elite Division style of racing at all levels, NASCAR said it will focus its resources and efforts on those Divisions that will help build and sustain a better developmental program for the future. Beginning in 2006 and continuing in 2007, NASCAR will implement several Grand National Division changes in an effort to reduce the cost of competing in the Busch North Series (which will be re-named the Busch East Series) and the AutoZone West Series. These changes include a less-costly "spec" engine, as well as composite bodies. The tentative 2006 NASCAR AutoZone Elite Division schedules are listed below. "Support for the Elite Divisions has been on the downswing for a number of years," said NASCAR Vice-President of Communications and Regional Touring Jim Hunter. "This change will allow NASCAR to focus more attention on the Grand National and Modified touring divisions." Following the 2006 season, the four current Late Model Elite Division Tours will be discontinued. The Elite Division tours were formed nearly 20 years ago, in the Southeast, Midwest, Southwest and Northwest regions of the country. 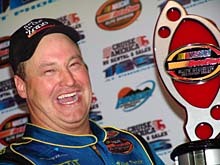 Guys like back-to-back Southwest Series titlist Jim Pettit will have to find a new place to race. Elite Division was designed to allow the best local racers an opportunity to race periodically at an advanced regional level," said Hunter. "The cost of competing at this level has escalated significantly over the years and participation has continuously declined in every region. It has also become extremely difficult for our member tracks to successfully host these events." Teams such as Turner Motorsports (#41) have made a big investment in the Elite Division. Sun., June 4* - Colorado National Speedway, Erie, Colo. Date TBD - The Milwaukee Mile, West Allis, Wis.
Fri., July 14 - Raceway Park, Shakopee, Minn. Date TBD - LaCrosse Fairgrounds Speedway, West, Salem, Wis. Date TBD - I-94 Raceway, Sauk Centre, Minn. Sat., Aug. 19* - Colorado National Speedway, Erie, Colo. Sat., Oct. 7 - LaCrosse Fairgrounds Speedway, West Salem, Wis. Sat., Apr. 15 - Evergreen Speedway, Monroe, Wash. Date TBD - Wenatchee Valley’s Super Oval, East Wenatchee, Wash. Sat., July 15 - Evergreen Speedway, Monroe, Wash. Date TBD - Evergreen Speedway, Monroe, Wash. Sun., Sept. 17 - Wenatchee Valley’s Super Oval, East Wenatchee, Wash. Sat., Apr. 29 - Greenville-Pickens Speedway, Greenville, S.C. Date TBD - Music City Motorplex, Nashville, Tenn. Date TBD - Greenville-Pickens Speedway, Greenville, S.C. Date TBD - Stockton 99 Speedway, Stockton, Calif. Sat., June 4* - Colorado National Speedway, Erie, Colo. Sat., July 15 - Stockton 99 Speedway, Stockton, Calif. Sat., Aug. 19* - Colorado National Speedway, Erie. Colo.